If, like me, you think both Macs and robotics are cool, then nothing could be cooler than using your Mac to work on robotics. Unfortunately, it hasn't always been easy to combine the two. In the old days you were forced to use Windows or try to get Virtual PC working in order to run the Windows-only software. Those days are slowly going away, and Macs are now an option for one very popular solution. The heart of most hobby robotics starts with the microcontroller. This is like a regular computer chip with the built-in ability to read sensors and send out commands. You hook in light sensors, motion detectors, switches, etc., so it can sense what is happening. Then you program commands to turn on lights, motors, switches, etc. All of this is made possible with a combination of hardware and software. The hardware has come a long way. You can buy circuit boards with everything you need already wired and ready to go. You just plug them into your microcontroller board, and everything is ready for the software. The software is critical for sending instructions to your robot. But for a long time, this software required Windows. This may be due to a biased idea that Macs are for creative types, while Windows is better for the technical and business types. One specific example is Parallax and its hobby microcontroller board called the BASIC Stamp. This uses the BASIC programming language, called PBasic, to program the microcontroller. It is a nice development tool for the beginner, because BASIC is an easy language to learn, but it was only written for Windows. Limited support for the Mac OS X is offered by an outside third party. Parallax doesn't offer any support for this software, and they don't even host the software from their website. Coming to our rescue is the open source movement. First were the programming tools, and then a new open source controller sprung up in the last few years, Arduino (left). This small development board (about the size of a deck of cards) has gain a following quickly. Not only did they open source the design for the hardware so that anyone can develop new boards, they also made the software available for Windows, Macs, and Linux. That really opened to doors to anyone interested. Their goal was to provide a solution made for the creative types who wanted to add electronics to their projects. Because it is open source, you can add or change anything about the design. This has opened the doors for dozens of add-on boards, called shields, and specialty code that is free to use that works with the shields. The popularity has gone mainstream. You can buy the Arduino and shields at your local Radio Shack store. Then you log in to the Arduino website for tutorials, sample code, project ideas, etc. I did a web search and found a local club that offers a place for people to get together and get help for their project. Some of these people are using Ubuntu Linux for development, and others are on Windows, yet there aren't the traditional barriers for them to help you with your project. The programming software doesn't have special features that are only available to Windows or Linux users. The code you write can be sent to them without any special changes. It is great to work in an environment where what computer you have isn't an issue. If you want to get into more involved in the circuitry, here are a couple of websites that offer Mac versions of the circuitry design software. Processing, a programming language for visual artists that was started in 2001. Wiring was inspired by Processing. 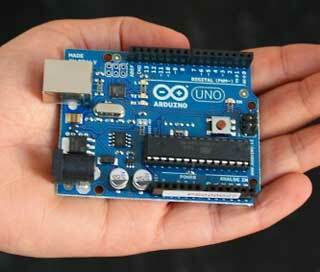 Phillip Torrone has some good thing to say about the Arduino over at the Make website. One of the key points is how it just works. That is another feature that the Arduino shares with Macs - the technology is wrapped up in an easy to use layer. It is so easy that I'm using it to teach my kids about both electronics and programming. Good luck - and maybe you'll be the next person to invent a robot that will change the world. The best part is it will have all been designed to work on a Mac - or any other computer you choose.